The company KADA Meble makes for many years built-in furniture, projects of furniture which are capable to built-in and free standing furniture. Our products are made of the best materials in the highest quality. We realize the service in the city Lublin and Lubelskie voivodeship. For our customers we are making the furniture to size: kitchen furniture, closets with sliding doors, wardrobes, bathroom furniture, bookcases, desks and many others depending on ideas of our customers. Moreover we are are dealing with formatting, covering, milling, spot-drilling of holes and other services. Before we accede to cooperation, we are making the measurements of the room where the furniture are going to be assembled. Then we are making the preliminary project. In this phase of cooperation the customer gets the computer visualization or he creates project himself but of course with our help. 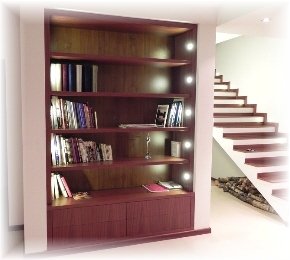 All our steps are being aimed at creating for you the imagined kitchen, wardrobe or bathroom. We offer large scale of colors, fronts and slabs.